I know it’s the middle of July, and not exactly breadmaking season, but I thought I would repeat one of my favorite blog posts/recipes. It’s for whole wheat sourdough bread done in the breadmachine. I make it almost every day. Last week I went on an 8 hour road trip. I took my sourdough bread with me, presliced. In my pre-Nourishing Traditions days I used to take bagels for us to munch on for road trips. I finally decided that the store-bought bagels tasted like play-doh. (OK, true confessions, yes I tasted play-doh as a child.) This sourdough bread tasted so much better and it’s much more nutritious for us than grocery store bagels! I don’t get the carby-overload feeling when I eat it. When I am home, frequently for lunch, I will toast this bread, slather the butter on, and then melt some cheese on it for a nutrient-dense grilled cheese sandwich. Doesn’t it look nummy? And the smell is so heavenly!!!!! I don’t have time to give a recap of the whole class here, but let’s just say that Melissa gave the best explanation of why whole grains should be soured, soaked, or sprouted before being eaten. It all has to do with phytic acid. She used a great, funny metaphor to explain it. That’s what you get when you have a writer who also is a baker. 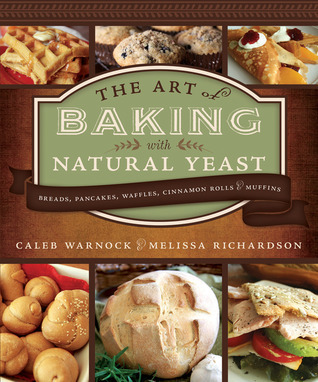 Melissa said she took a writing class from her coauthor, Caleb Warnock, and she paid him in bread when he started noticing that the treats of baked goods she brought to class were delicious and nutritious! Her bread made with natural yeast was so good for him that he was able to get off his medication for acid reflux that he had been using for over ten years! Amazingly enough, the lady who hosted the class said that her husband, who has been diagnosed with celiac disease by his doctor, can eat the bread that she makes using Melissa’s recipes. Ladies, whole grains can be good for you if you prepare them the right way! If you don’t, then you are asking for digestive and other troubles, like tooth decay. All this talk about gluten intolerance and allergies could largely evaporate if we learned how to prepare our grains with fermenting (sourdough, aka natural yeast), soaking, or sprouting. See how light and fluffy this bread looks? Yes, it’s whole wheat sourdough bread! This is just what Melissa’s samples looked like in the class. It was so great to see, or have a vision, of what sourdough bread can look like. It doesn’t have to be dense, solid slabs that could be used as bricks or paperweights! I came home and replicated her bread in the picture above. Her bread really did look just like this. So I experimented with the recipe and found that if I cut the amount of natural yeast (aka sourdough start) in half, and kept all the remaining ingredients the same, the recipe worked perfectly. So here is my modified recipe that works just right in my machine. Hopefully it will work in yours. Hint: if you don’t have a breadmachine, check your local thrift store. That’s where I got mine, really cheap, only $5! Put the hot water in your breadmachine loaf pan. Add the butter so it can start softening in the hot water. Then add the other ingredients. Install the pan properly so it is “seated” in your breadmachine. Choose the longest setting for whole wheat bread. On my machine this is setting #2, which takes 4 hours and 10 minutes. When you hear the machine start mixing, which for my machine is 30 minutes into the cycle, take a rubber scraper and help the machine out by bringing up the sides of the dough mixtures. Watch the mixture form into a ball. If it doesn’t form into a ball, add more flour until it does. Hint: If I don’t have time to wait for the 30 minutes into the cycle, I will choose the “Dough” setting on my machine. That allows the machine to start kneading the mixture right away. I will watch and make sure a ball forms. Then I will cancel the dough cycle and choose the “whole wheat bread” cycle and start it over. Ever since I have followed what I just wrote in these last two paragraphs I have had perfect bread every time! When it’s done, smother with lots of butter and honey while it’s hot and enjoy! I’ve been looking for some sort of recipe for a fluffy sourdough bread! I’d like to start making my bread again, but having switched from white to wheat flour, I haven’t been able to get it right for sandwiches. Thank you! Is the taste super sour or more mild? It is super sour depending on how long you let the starter ferment. If you just let it ferment for a day it’s not super sour, just a bit sour. But if you and your kids are used to store bought white bread you will think it’s super sour.